During the summer of 2010, while traveling from California to the Yucatan on an epic road trip to do anthropological fieldwork, I happened by chance to meet two shamans—wise men, healers, diviners, explorers of sacred realms. Later, working in rural Haiti, I met and grew to intimately know several other religious figures that I came to view as practicing a form of shamanism. In scholarly literature and the public imagination, these mysterious and mystical religious figures found across the world are often considered remnants or exemplars of archaic religious culture (Eliade 1964). Extensively exploring shamanic beliefs and practices, anthropologists have noted the existence of such religious practitioners in many cultures in Asia, Africa, Australasia, and the Americas. Meeting these figures changed my perspective on the phenomenon of shamanism. I had initially learned from anthropological debates and texts that shamanism was a problematic, overused concept that often generalized and romanticized the archaic human past. However, after meeting shamans, getting to know them, and participating in shamanic ritual events, I found an amazing array of continuities and parallel beliefs and practices in cultures that had been separated by oceans and thousands of years of human history. Figure 1. 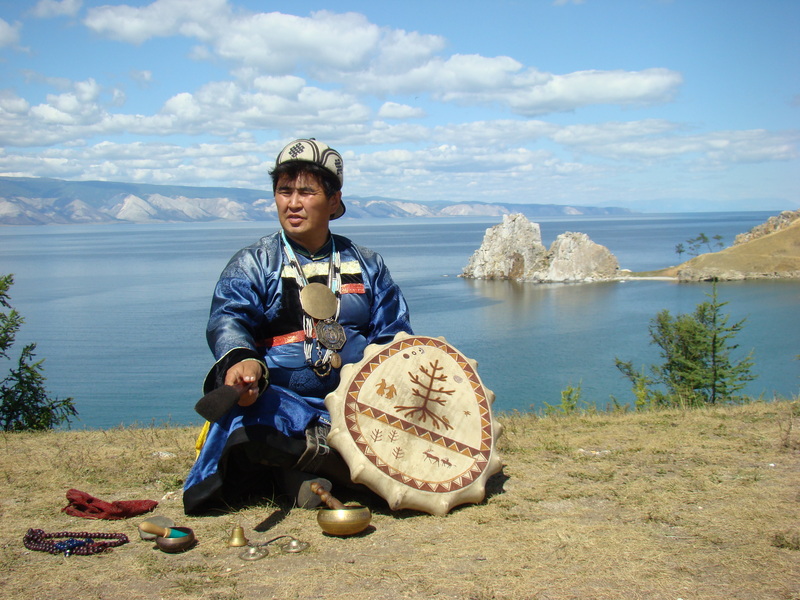 Buryat shaman on Olkhon Island, Siberia. Photo by Аркадий Зарубин, CC BY-SA 3.0 via Wikimedia Commons. As a result of my first-hand experiences, I now think that the term ‘shaman’ is appropriate to use for categorizing and labeling specific types of religious leaders. That said, I would also venture that the term is often used too narrowly and arbitrarily (‘shaman’ is less often applied in communities like Haiti). Additionally, in contrast to many scholars and members of the public, I do not believe that all shamans are remnants or direct descendants of a unified pan-religious system that existed in the archaic past. Instead, I view shamanism in a manner akin to Gilles Deleuze’s notion of a diagram or Max Weber’s notion of ideal types (for diagram see Delanda 2006; for ideal types see Shils and Finch 1949). This means I view shamanism as a “universal singularity” or a religious form that can emerge and successfully gain a foothold in a given society when the religious system and social order are compatible with individual small-scale religious leadership. Such systems must require highly flexible social actors, like shamans, who can aid individuals (patients) and lead groups (apprentices and members of a community) in spiritual matters. Furthermore, shamanic individuals and these corresponding social relationships can only exist when specific social, environmental and historical contexts are present—hunter-gatherer or small-scale agricultural societies without the highly dominating presence of an organized religion. In other words, there must be an individual/group need for shamanic leadership. This generalized view contrasts with the more specific evolutionary perspectives detailed later below. Combining an overview of scholarly literature with my own personal ethnographic accounts, I briefly explore the contexts, practices, and relationships that shamanism produces in an effort to reexamine this important religious singularity that has emerged widely across time and space. More in-depth studies on the topic can easily be done using eHRAF World Cultures. Within the array of ethnographic reports from hundreds of cultures around the world, parallel shamanic practices can be analyzed and explored to better understand this form of religious belief. Shamanism has long been studied by anthropologists and religious scholars around the world. Heralded as the first complete cross-cultural study on shamanism, Mircea Eliade’s work “Shamanism: The Archaic Techniques of Ecstasy” explored variation and similarities in religious specialists, who were often healers in smaller societies. Recognizing the importance of Eliade’s work, anthropologist Michael Winkelman (2010:45) said that “Eliade’s (1964) synthesis of the cross-cultural data illustrated universals of shamanism and its social functions.” Furthermore, Winkelman noted that Eliade’s research revealed a shamanic specialization in understanding, managing, and shaping consciousness and emotions. Akin to primordial psychologists, shamans in societies across the world played important roles in managing “social relations, health, and interaction with the natural and supernatural” (Winkelman 2010:45). Figure 2. 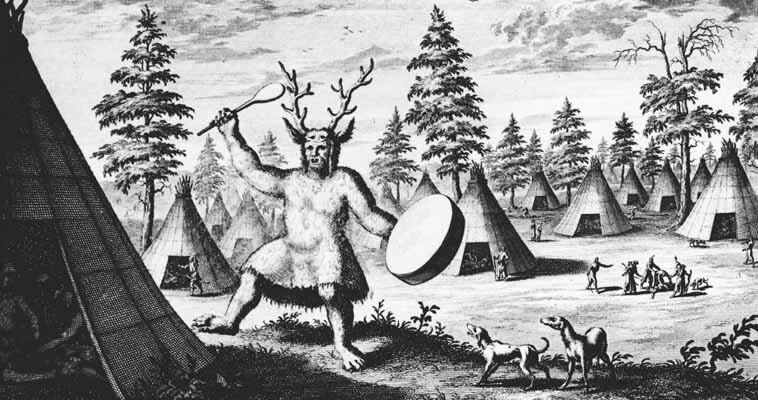 The earliest known depiction of a Siberian shaman, by the Dutch Nicolaes Witsen, 17th century. Nicolaes Witsen based this drawing from experience of a stay among the Tungusic and Samoyedic-speaking indigenous peoples of Siberia. Public domain. Winkelman’s use of the term ‘shamanism’ was not haphazard but derived from a meticulous statistical analysis. In his 1984 dissertation, Winkelman used ethnographic data from HRAF; statistical methods such as cluster analysis; and a coding system accounting for more than two hundred variables relating to ritual procedures, forms of induction into shamanistic practice, qualities of altered states of consciousness, spiritual power relations, and many more theoretically and anthropologically defined variables relating to shamanic beliefs and practices. More specifically, in his 1984 study, Winkelman used “a 47-society stratiﬁed subsample of the Standard Cross-Cultural Sample (SCCS)” that included societies “ranging from 1750 B.C. (Babylonians) to the twentieth century” while including geographic regions from all over the world (2010:50). All said, a cross-cultural approach made it possible for Winkelman to empirically define shamanism by detailing the practices and relationships shamans create in each sampled society. Coinciding with these characterizations, shamans frequently are community leaders that uniquely participate in healing and divination ceremonies that last all night. As Eliade (1964) suggested, during such ceremonies shamans utilize “archaic techniques of ecstasy,” which are ways to direct and intentionally alter the states of consciousness in themselves and their patients. To reach such states, shamans use methods like ingesting psychedelic herbs from their local environment and hypnotic drumming, often in combination with extreme forms of physical exertion. Using these techniques, shamans directly modulate phenomenological experiences of existence in time in space (Winkelman 2004, 2010). These induced trances often allow shamans to connect with other planes of existence. For many shamans, this includes alternate spirit worlds, realms of death, and heavenly planes. Most shamans believe that they access these other planes via “soul journeys.” Somewhat similar to the concept of astral projection, in a shamanic soul journey, the spirit or soul intentionally flies out of the body to travel to these other planes. In these other planes, shamans often experience ordeals of death and rebirth and sometimes communicate with otherworldly spirit entities. All said, the utilization of these techniques can have profound physical and spiritual impacts on the shaman and their patients (Winkelman 2010). Because most shamans have extensive knowledge of local mythological histories, they can recite mythological stories for their patients even during ritual treatments and ceremonies in which both the shaman and their patients are in an altered state of consciousness. The shaman can poignantly highlight important sacred places and historical periods for their subjects. For these treatments to be meaningful and affective, the shaman must communicate how the patients’ issues and ailments exist in relation to their given context of local spiritual events and understanding of the unfolding cosmos (Winkelman 2010). Speculating on the evolutionary reason for this unique form of treatment and ceremonialism, Winkelman argues for a “neurotheological” theory wherein shamanic rituals and trance states have beneficial “integrative” effects on human cognition—for both the shaman and their patients and consequently their society as well. Winkelman’s theory is that “shamanic processes intensify connections between the limbic system and lower brain structures and project these synchronous integrative slow wave (theta) discharges into the frontal brain.” This integrates the different brain systems and leads to an array of positive effects, including neurological benefits related to: “enhancement of attention, self awareness, learning, and memory and elicit mechanisms that mediate self, attachment, motives and feelings of conviction” (Winkleman 2004:194). Furthermore, since shamanistic healing ceremonies are often community affairs, individual psychological integration can lead to enhanced community cohesion and the “reintegration of patients into the social group” (Winkelman 2004:206). In contrast, Manvir Singh’s (2018) newly proposed theory argues that shamanic beliefs exist as a “by-product” of early human psychological states of intuition and misunderstanding of cause-and-effect relationships. Singh specifically defines shamanism as “a set of traditions developed through cultural evolution that adapts to people’s intuitions to convince observers that a practitioner can influence otherwise unpredictable, significant events” (2018). Simply put, shamanism is fueled by superstition about why things happen or don’t happen. With the aforementioned theories and models in mind, I reflected on my experiences with the shamans that I had met and began to explore the following questions. Was the term shaman applicable and useful to label these distinctive individuals? What shamanic beliefs and practices did my ethnographic subjects exhibit? How comparable were their beliefs and rituals? What did this mean? By answering these questions I hoped to determine if they fit the model of shamanism outlined in Winkelman’s cross-cultural research (1984, 2010). The shamans I met had been from cultures separated by thousands of years of human history, shackled and oppressed by colonial empires, and shaped and transformed by the inroads of modern world. Despite the differential impacts on their societies and religions, all three shamans believed in the power and validity of an extremely similar set of ritual practices that define shamanism in contrast to other forms of religious beliefs. Figure 4. 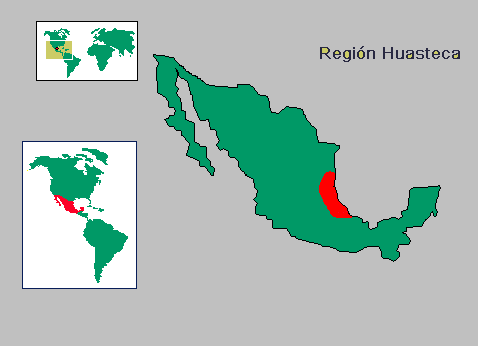 Haustec region in Mexico. GNU. CC BY-SA 3.0 via Wikimedia Commons. The first shaman that I met was a Huastec shaman in the north-central region of Mexico. The second was a Yucatec shaman in Quintana Roo, and the third shaman was from a very different cultural background—a woman that I studied, knew, and lived with for some time in rural Haiti. The Mexican shamans represented two distinct cultures, yet the resemblance between the men’s beliefs and practices was striking. In the case of the Haitian shaman, similarities in belief and practice also appeared to cross an ocean. Although she would not typically be considered a shaman, the Haitian Petwo mambo (female vodou leader that preserves rituals and songs while maintaining spiritual connections) effectively performed as a shaman with practices, beliefs, and a worldview that closely mirrored the Mexican shamanic traditions. Often misunderstood, mambos in rural Haiti perform in a flexible and less dogmatic religious system that contrasts with that of Rara mambos. (More well known, Rara Manbos perform similar ritual functions yet exist in a more formalized hierarchical priestly religious system in dense cities like Port Au Prince). Below, I will detail how the three shamans I met exhibited the cross-cultural shamanic characteristics described by Winkelman. First, all three shamans performed rituals and practices to achieve trance states—specialized altered states of consciousness. For all three, the rituals allowed them to fly in a “soul journey” and were accompanied by various extreme and non-extreme forms of prayer, dance, and drumming. My subjects did deviate from one of the more studied elements of shamanic practice. In contrast to Winkelman, Eliade, and others’ generalizations, none of these figures imbibed hallucinogens to achieve the aforementioned trance states. That said, even in Winkelman’s analysis (1984, 2004, 2010), the use or nonuse of hallucinogens does not necessarily qualify or disqualify one as a shaman. 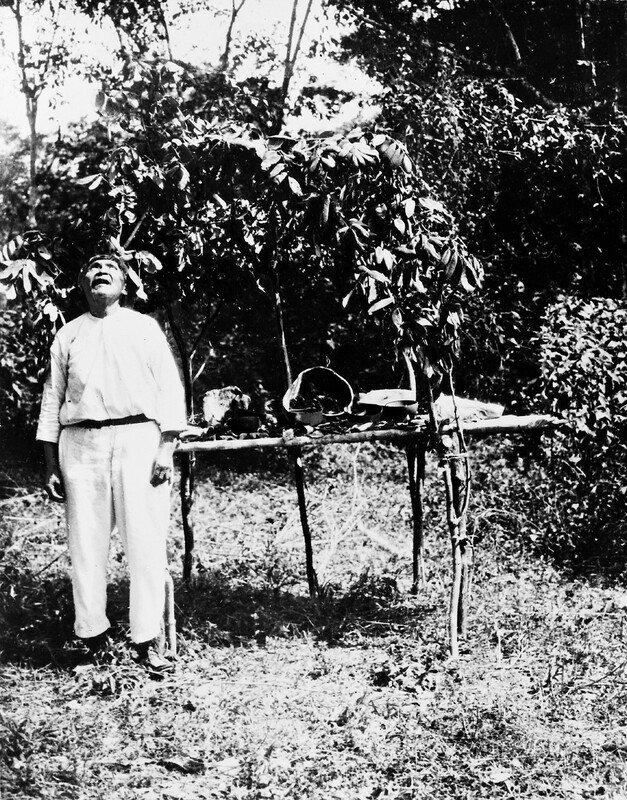 The Yucatec and Haitian shamans did partake in ritual alcohol consumption (balche and cleren respectively). Highly potent local brews allowed both the Haitian and Yucatec shamans to easily achieve trance states wherein they practiced divination and diagnosis. During and after these states, visions were shared with individuals and larger local community groups. The Haustec shaman, however, avoided all substances. Rather than use a drug or a drink to achieve an altered state, he focused on entering into altered states through dreaming. This may have been an artifact of local history. Interaction with non-locals, traders, and government officials that “had problems with the drink” appeared to be related to an unofficial alcohol prohibition that most indigenous members of society followed. Each shaman entered into the lifelong profession through a spiritual event in which he or she faced a life-or-death crisis. The Haitian shaman-healer began training and accepted the mantle of a manbo after she faced an extreme bout of physical and spiritual sickness that brought her to the verge of death. In dreams, spirit entities called the lwa came to her and provided instructions to heal her sickness and to save herself. This assistance was provided on the grounds that she would serve these spirits, following in the footsteps of her mother and grandmother. The two Mexican shamans had similar stories wherein they accepted shamanic destinies after being met with spiritual threats of death. They also received instructions from other spirit entities that made it possible for them to heal themselves through herbs and appropriate magical means. These extreme initiation events pushed them personally and professionally to become shamans and healers for their communities. The unique relations that each individual had with the spirit realms was known and respected by all, leading to a steady flow of patients and incomes. Although their incomes were supplemented by trading herbs and tobacco or land renting, each considered shamanic practice to be their main profession. It defined their identities and shaped their relationships with local and even extra-local communities. Many people in each community looked to these shamans for leadership and guidance during times of crisis or difficulty. All three shamans had a very similar perspective on health and sickness. Their healing practices focused on spiritual causes of sickness. In fact, the shamans understood the root cause of most physical illnesses to be “sickness of the soul” and often implicated specific kinds of sorcery. Each shaman had methods to cure and protect an attacked soul. Reflecting their residence in small-scale agricultural societies, the shamans did not use forms of hunting magic but instead used agricultural magic. As Winkelman (2010:53) states, such shaman-healers often perform and lead agricultural rites. Before the planting season, the Yucatec shaman regularly performed “Chac Chaac” ceremonies, which date to pre-Hispanic times. For the “Chac Chaac,” the community gathers to enjoy a large ritual feast and produce food and drink items for an altar made of sticks, branches, and small pieces of wood that is built to symbolically represent the cosmos. After imbibing ritual alcohol called balche, the Yucatec shaman makes rapid-fire prayers and appeals to the spirits at his altar in an effort to bring rains for the agricultural season. The Haitian mambo and her male counterparts performed rituals when establishing agricultural plots each year. Setting up a small wooden chamber containing an altar in an agricultural field, the shamans used prayers and sacrificial items to produce magical barriers that emanated out from their location, protecting crops from spirits, sorcery, and theft. Although he provided little details on the matter, the Haustec shaman performed blessings on agricultural areas and on local sugar refining presses. By appealing to supernatural forces, these rituals were intended to safeguard and induce large crop yields and production each year. During ethnographic conversations with each shaman, I shared what I had learned about the other shamans’ practices and beliefs. To my surprise, all found each other’s beliefs and practices mutually intelligible and perfectly rational. Given that geography and human history separated these individuals, I was most surprised to hear this perspective, especially from the Haitian mambo. Although their societies were different in many ways, these shamans appeared to intimately understand each other’s goals, rituals, and beliefs about life, death, and spiritual forces. I chalk up this translatability to the similar perspectives the shamans gained in their social and spiritual roles. Therefore, I believe the term ‘shamanism’ is useful for describing these religious actors and defining this regularly occurring religious singularity, or historically prevalent religious form, that has occurred in divergent societies through millennium of human existence. DeLanda, M. A new philosophy of society: Assemblage theory and social complexity. A&C Black, 2006. Eliade, M. 1964. Shamanism: Archaic techniques of ecstasy. New York: Pantheon Books. Shils, E. A. & Finch, H. A. 1949. Max Weber on the methodology of the social sciences. Glencoe, Ill.: The Free Press, 1949, p. 93. Siikala, A. 1978. The rite technique of Siberian shaman. In Folklore fellows communication, 220. Helsinki: Soumalainen Tiedeskaremia Academia. Singh, M. 2018. “The cultural evolution of shamanism”. Behavioral & Brain Sciences. 41: e66, 1–61. doi:10.1017/S0140525X17001893. Summary of the cultural evolutionary and cognitive foundations of shamanism; published with commentaries by 25 scholars (including anthropologists, philosophers, and psychologists). Winkelman, M. 1984. A cross-cultural study of magico-religious practitioners. Ph.D. diss. University of California, Irvine. Ann Arbor, Mich.: University Microfilms. Winkelman, M. 2010. Shamanism: A biopsychosocial paradigm of consciousness and healing. ABC-CLIO, 2010.